Pack of 4 Extra Blank Strips For MM11. These are spare strips to fit the hand cranked 20 note Musical Movement strip player. 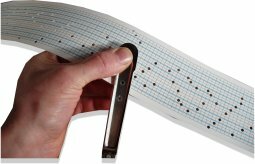 The movement MM11 is very easy to use, and having extra strips will enable you to arrange more tunes to add to the repertoire of your MM11 musical movement. Each pack of spare paper strips contains four blanks.